Want extreme hold without compromise? Extreme Control is our strongest holding hairspray that provides the extra firm hold you need to keep any style. With 24-hour hold and anti-humidity protection, your style stays all day long, even in extreme humidity. Our strong, yet flexible formula, infused with bamboo extract, keeps you in control of your style for 24 hours. Added frizz control ensures bounce-back hold that lasts all day. Our light, sparkling fruit fragrance will leave your hair smelling fresh and vibrant. Hold can 10-12 inches from hair and spray in an even, all-around motion. Spray on dry hair to finish any style. Layer where it's needed most for added hold. 1119005 Aqua / Water / Eau, Dimethyl Ether, Alcohol Denat., Polyester-5, Polyurethane-6, Parfum / Fragrance, Glycerin, Limonene, Hexyl Cinnamal, Linalool, Ethylhexyl Methoxycinnamate, Caprylic/Capric Triglyceride, Amyl Cinnamal, Bambusa Vulgaris Extract. F.I.L. D46077/2. Rated 1 out of 5 by Amy325 from Not so great anymore! This has been my favorite hairspray for years but the last 2 cans have been horrible. It's comparable to spraying wet air on your hair. There is NO hold whatsoever and it just leaves it a wet mess! So disappointed! Definitely moving on to something that has "extreme" hold. Rated 1 out of 5 by bighair from No good. 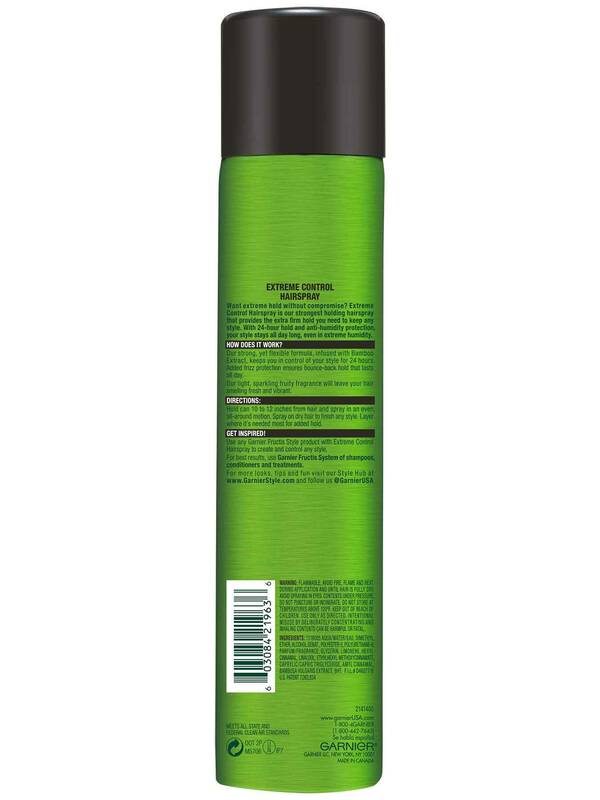 Makes hair wet, flat and holds NOTHING Garnier - Extreme Control Hairspray should be called Extreme Hair FLATTENING Spray. I am shocked to find, that considering your primary purpose is to make products that work for hair, that you would promote this as "hairspray". Upon application, it makes you hair wet and flattens your hair. It does not hold a thing. Then when it finally dries, it leaves hairspray flakes in your hair. Unless I have a defective can, this product is a disaster. I wish it worked, as it smells GREAT!!! But I need a strong HAIRSPRAY, not perfume. Rated 3 out of 5 by ShredtheGnar from Used to be great! I used to love this hairspray, but they must have changed the formula over the past year. Doesn’t hold like it used to and has more shine. Time to switch to something else. Rated 5 out of 5 by DiscoPeach from Garnier Exteme Control Hairspray I very much enjoyed testing out this hairspray and overall considered it to be a product I like and would use in my daily life. This product is labeled as a 4 out of 5 on the its hold strength and I definitely found that to be true. It worked well for styles where I wore my hair up and where I teased it. It has wetter formula so I would say it is more useful for creating styles where you don't want the hair to budge, rather than styles where the goal is to have a soft moveable texture. The spray had a pleasant almost fruity scent that was not at all overpowering. My boyfriend also uses it when he creates a wave in his hair. He said he thought it had great hold and lasts for at least 6 hours before he needed a touch up. Overall definitely a product we would both recommend. Rated 5 out of 5 by Jlynn2610 from Extreme Hold Hairspray is Great! 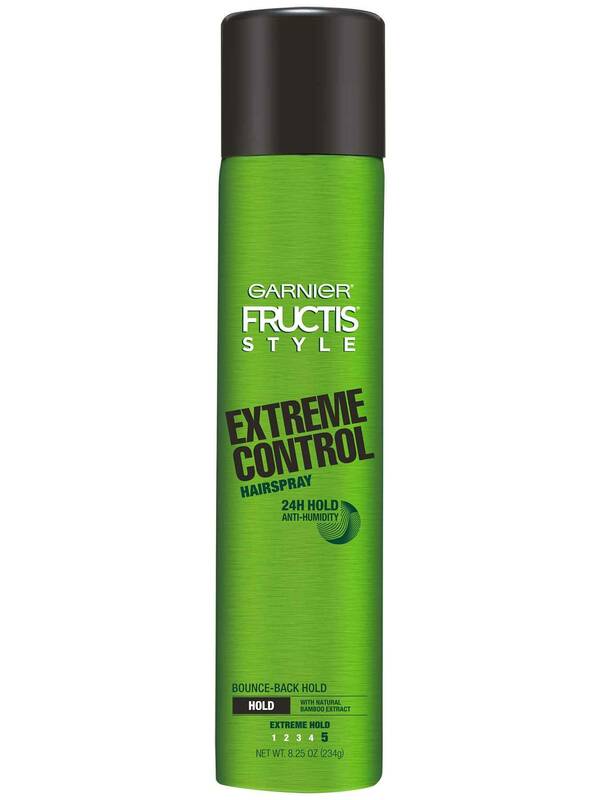 Garnier fructise Extreme Control hairspray not only holds great, but smells great also! I like in a dry, windy climate and this hairspray provided me with all day hold. Rated 4 out of 5 by JoyJoy1984 from Great hold and smell! I am not a big hair spray user traditionally. I think that is because I have never found one I really like. Well, that is over. I love this hairspray. It smells great and holds amazingly. I used it to keep a bun in place and it exceeded my expectations. So much that even the next morning my hair was still in place! The only thing I didn't love about it was that you can't brush through your hair after applying this. But that is just because the hold is so good. Great product. Rated 3 out of 5 by shan1228 from It's decent, Smells. Great I have been using this hairspray for about two weeks. It holds extremely. Well and smells amazing! I feel like. It makes my hair frizzy. I have curly hair so my so my hair type is already frizzy. I wouldn't purchase but I do think it would work great on a different type of hair. Rated 4 out of 5 by Shanielduh from Fly Aways Still Here First this product smelled amazing. I really loved that I didn't smell like a chemical factory. So I usually use hair spray as a way to keep flaways under control. This product did ok for that. This product might be better for me in the summer time vs in the winter when static is everywhere from being so dry.